The Archbishop of York has intervened in a political row over Yorkshire devolution. Sheffield is set to elect a regional mayor next year, but most councils in the county favour a region-wide alternative. In a letter first seen by the Yorkshire Post, Dr John Sentamu called on the government to introduce an All Yorkshire Devolution Deal by 2020. Ministers said they had no plans to undo the existing deal with Sheffield. Despite a range of proposals, councils have so far failed to agree a pan-Yorkshire deal to gain devolved powers. Dr Sentamu's letter to Northern Powerhouse Minister Jake Berry outlines plans designed to overcome government objects to the so-called One Yorkshire solution. He proposes a phased approach, in which the election of a Sheffield City Region mayor would serve as an "interim step". The letter said it was agreed "urgent steps should be taken now to draw up plans by the end of January 2018 for an All Yorkshire Devolution Deal to take effect with the election of a Mayor for the whole of Yorkshire in May 2020". Dr Sentamu asked for discussions to begin "as soon as possible". He said agreement with the government would have to be reached before the Sheffield City Region mayoral election next May to move towards a 2020 deal for all of Yorkshire. A Department for Communities and Local Government spokesman said: "There is no intention of undoing the Sheffield City Region deal that was agreed in October 2015, which has been partly implemented and would bring around £1 billion of new government investment to the area. "We would welcome discussions with the other Yorkshire councils if they were to come forward with a widely supported greater Yorkshire devolution deal for rest of the county, providing this does not unravel the Sheffield City Region deal." 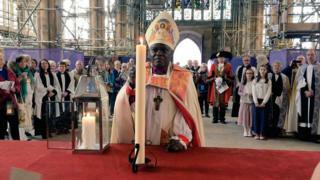 John Sentamu was appointed Archbishop of York in 2005.